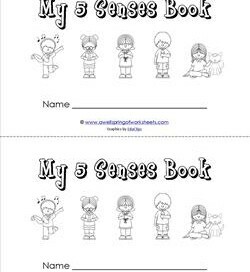 These five senses books are quick and easy to put together. Each page has two of the same image so you can make multiple books at one time. Copy, cut in half, and staple together along the left edge. 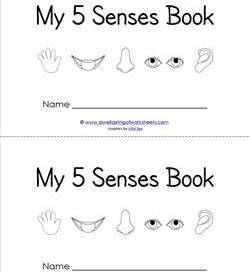 Kids read each page and trace the word representing the sense (see) and the part of the body that sense is experienced through (eyes). Then they can color! Need a five senses book that focuses on the body parts? This book has graphics of eyes, ears, a nose, a mouth, and a pair of hands. Read the page, trace the words on the primary writing lines, and color. The adorable children in this five senses book show us how each sense is experienced (eating ice cream, for example – yum!). Kids read each sentence, trace the words, and color the pictures.